Seriously... did you know your smartphone can help you catch fish with a smart sonar? We've all heard the tired joke of how an expensive hi-end smartphone attracts all the... ahem, felines, in the club. As with every joke, there is (undeniably) some truth to this one, but you may still be surprised that your phone can, indeed, help you catch fish! That's right, fishermen and fisheress-es around the world with Android and iOS smartphones can equip themselves with the most "new-age fish hunter" device there is — a smart sonar! 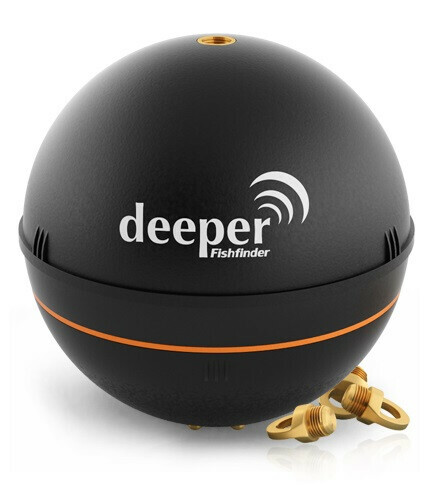 Meet 'Deeper', the first of its kind portable, wireless fish finder, designed for amateur and professional fishermen. So, what does this spherical object of digital fishing supremacy do? Well, it's supposed to attach itself where you hang the hook on the fishing pole, and dive in the murky waters at up to 130ft (40m) below the surface. Then, it pulls off high resolution sonar shots that reveal the sea bed fish species and let you target specific types only. The integrated thermal sensors provide information about the water temperature, so you'll know when the fishies are nice and warmed up for biting. Best of all, you can share your achievements with the worldwide community of smart fishermen! But unlike the days of old, you won't be able to peddle lies about the size of your trophy, which might take away all the fun. The miniaturized Sonar that is 'Deeper' feeds those clear, almost picture-like images of the seabed and nearby pisces to your Android or iOS smartphone via Bluetooth connection, which means the module can function from as far as 150ft / 45 meters away from you. Moreover, 'Deeper' works in tandem with an app that allows for full control over the smart fishing accessory— adjust the sonar's sensitivity, switch between different frequencies for more seabed exploration options, put the sphere into low-power mode, or "wake" it up for a new round of fishing. To bring your fish cyber-hunting game to the max, you can even trick out the sonar with specially designed night fishing covers, so you can catch fishies while they sleep! Well, what can we say — we're not passionate fishermen or anything, but the crazy possibilities enabled by the virtues of mobile technology never cease to amaze us on a daily basis! Cool idea, maybe software updates will allow to have multiple deeper's to stitch together sonar feeds. I wonder what the field of view is in terms of depth. I know it can be dropped down to 130ft, but will it give me a sonar of all 130ft of depth? Also, name sounds a little bit like an adult toy than fishing tool..
Costs about $200, which I don't think is very pricey in the world of fish finders. The mobility aspect is really cool. You better make sure you have some seriously sturdy fishing line when you drop that thing in the water. It's not like losing a lure $$$! Boy, I just like to keep it simple and prefer a fishing trip to have as little technology involved as possible. Worm, maybe a bobber, and cast from shore.